The Chairman of Har Homa authority in southern Jerusalem says construction in the neighborhood is continuing apace, US demands notwithstanding. Construction at Har Homa is continuing apace, the chairman of the authority in charge of developing the southern Jerusalem neighborhood said Wednesday. 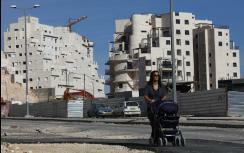 Yechezkel strongly denounced Israelis who have been leaking news of construction starts in the capital. “I do not take kindly to the attempts by a certain sector in Israel that does not accept the election results and continues to undermine the government in a very indecent way,” he said. “I personally think we should 'lower our profile' and refrain from announcing every construction start. 'There is no blessing except in that which is hidden from the eye,'” he quoted a Talmudic sage. "We are a young neighborhood [where] more than 40% [of the residents are] children and over 90% [are] keepers of tradition, and I hope that immediately after Passover there will be allocation of plots for synagogues,” he said.